Let’s get the obvious bit out of the way first shall we. No, there is no fish in fish flavoured pork. It’s called that because it uses a mix of flavours and aromatics that are commonly used in seafood dishes. What it does have is a wonderful, and powerful, combo of intense flavours. I was put in the mood for Sichuan (not that it takes much) by this recipe over at Hollowlegs’ blog. It was kind of a last minute affair so had to improvise. After all, where can you find cloud ear mushrooms at 8pm on a cold Monday night in NE London? Happily, it’s one of those dishes that can be stretched and tweaked to fit whatever you have in the cupboard. No pickled chilli paste? Don’t worry, harissa or Turkish chilli sauce (of which there is plenty in NE London) are great stand ins. 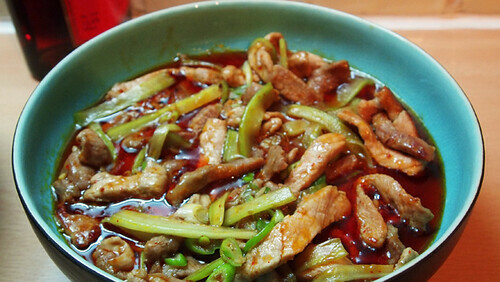 The dish itself is chewy, slithery, spicy and pungent. For me, along with its auberginey sibling, it’s the quintessence of Sichuan cooking. A combination of punchy flavours and textures held together in a careful balancing act. Subtle it ain’t. But if you need something red in tooth and claw (and oil and meat) then this is perfect. And unlike a hot pot or stew, it only takes a few minutes to make. When you take a mouthfull, layers of warming, sharp and sweet flavours open on your tongue like a fiery flower. It’s incredibly satisfying and incredibly moreish. I dare you to start and then leave some for the next day. G’wan, I dare you. I couldn’t. Everything all laid out. *sigh…* So neat. So satisfying. 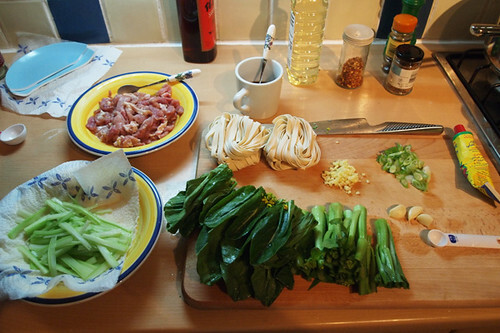 For two or three with noodles and some green veg. Add another savoury dish and it would do four. The key to this is having everything ready to go, because once you’ve started, the whole thing only takes about ten minutes or so to cook. The recipe calls for cloud ear mushrooms, bamboo shoots and pickled chilli paste. I didn’t have these and so left out the ‘shrooms altogether, and substituted celery for bamboo shoots and harissa for the pickled chilli paste. It still tasted pretty damn good. I also used corn instead of potato flour. I served it with some flat wheat noodles tossed in a little sesame oil and some choi sum (tender stem broccoli is a good substitute) boiled for 3 minutes. Slice the pork as finely as you can. I flattened some loin and sliced it into 3mm slices. Add the marinade ingredients and stir. Leave it while you do the rest. De-string and finely slice the celery. Scatter some salt on it and leave it on some kitchen roll to drain. Mix together the sauce ingredients stirring until the corn flour is fully absorbed. Add the oil to pan and heat until it’s shimmering and smoking hot. Add the pork and stir fry until it separates and colours a little. Add the chilli sauce and stir fry for a minute or two until the oil is red. Add garlic and ginger and stir fry for 30 seconds until you can smell them. Add the celery and stir fry until warmed through. Stir in the sauce, add the spring onion and stir fry it for a minute more. Serve. I love the word “quintessence”! Hooray for mis en place – I am so going to make this! My stomach, it grumbles. I’ve come across the term “fish fragrant” but not “fish flavoured”. Both make me laugh. Sea spiced! There’s another term for it! Mmm… choi sum – love it! A bit of winter spice to warm us all up on these cold nights. Excellent. @meemalee – me too! Glad it’s created such an effect on your belly I found the whole fish flavoured thing really confusing at first, now it is merely funny. @Su-Lin – sea spiced always makes me think of seaweed and kelp… As for Choi Sum, i adore it and will have it with everything. @Mzungu – Amen to that! Fish-fragrant, fish-flavour, sea-spiced – who cares what its called! It’s all good. But I can’t believe you slipped in some celery into the mix! Celery is one of those veggies, I’ve never got one with. @Mr Noodles – I thought the celery worked well, but then i do love the stuff. And it just added a little more texture to the finished dish. I did miss the mushrooms/fungus though. I like the way you improvised this. It is great done with aubergine and minced pork too, the flavours are just too appetising. Next time you are in a Chinese restaurant, try this dish, it usually comes in a hot pot and is delish. @May – thanks! I’ve never let a lack of the right ingredients stop me when i’m in the mood for something. I will be sure to order this next time i’m eating Sichuan out. @catty – thanks! It’s the ad-libbing that i like most about cooking. I’m definitely a “bit of this bit of that” kind of cook. Sometimes it blows up in my face, sometimes it works. And yes, this was one HOT winter dish. @Sasa – I hope so, and it’s a good spicy hot ‘un of a fish flavoured dish, perfect for when it gets snowy.